How much does Bethel College charge for tuition now, and how much are they going to ask for in the future? How does this differ from other colleges? Learn more on this page. Knowing tuition and fees related to going to Bethel College lets you plan economically for your college years. Look at the data below to learn how Bethel College's price stacks up to other colleges and if you need to plan for tuition increases. For nationwide, regional and statewide comparisons, check out the table below to find out how Bethel College compares to other colleges. How Much Does Bethel College Charge for Tuition? In the 2017 - 2018 academic year, full time undergrads at Bethel College were billed $8,100, before modifications for financial need. $8,000 was the price of tuition. $100 was the charge for fees. Tuition and fees take care of the cost of attendance for one year of school, but do not cover room and board, which is an additional cost you will get when living on campus. However, most students end up spending under maximum tuition because they qualify for financial aid along with other rate reductions. How much does Bethel College cost per credit hour? Go to the Part Time Tuition & Fees page for more info. Tuition and fees at Bethel College have stayed steady in the past 5 years. We expect the price tag on fees and tuition this year will be $8,125. If prices remain stable, two years at this school will cost you $16,275 and four years will cost you $32,652. In addition, you may have additional expenses such as room and board, transportation, and books. 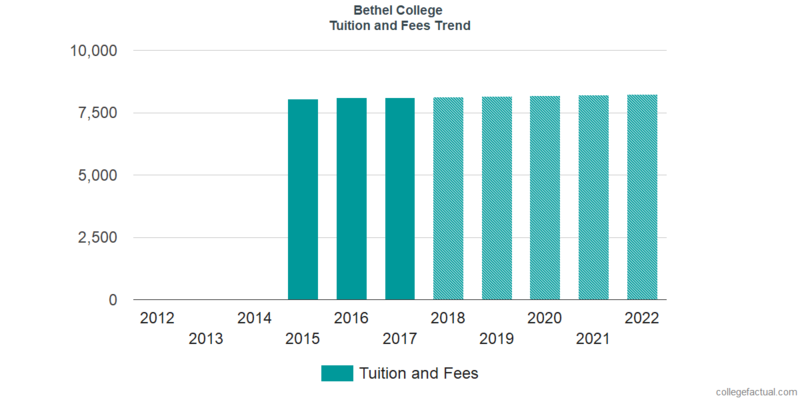 The next chart displays projected upcoming fees and tuition for undergraduate students at Bethel College. At a lot of colleges you will wind up paying more in your final year of school than you will in your first. This is due to annual cost growth. It's good to keep yourself informed!